E.K. 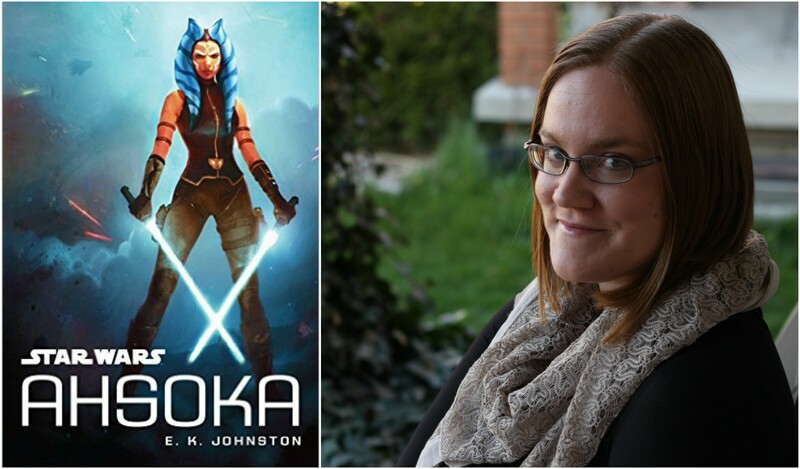 Johnston is the author of Ahsoka and the short story “By Whatever Sun” that was a part of the anthology From a Certain Point of View. Her other books include A Thousand Nights and The Story of Owen. She was kind enough to answer a few questions via email for 365 Days of Star Wars Women. When I was very little, I started listening to the Return of the Jedi on vinyl. It was kind of a radio play type thing, with the voices and sound effects and whatnot. I really don’t have memories before I knew what Carrie Fisher and Darth Vader’s respirator sounded like. My favourite character has always been Leia Organa, with Padmé, Hera, Sabine, and Ahsoka rounding out my top five (not necessarily in that order!). Clearly I’m in it for the Rebel Girls. I think the only two Legends books I’ve ever read are KENOBI and RAZOR’S EDGE, both of which I absolutely adored. I’ve read most of the new canon (at least, the ones about the good guys). LOST STARS has my heart forever, though I also love THE LEGENDS OF LUKE SKYWALKER and the plot of Battlefront II pretty dearly. For me, it’s less an era than it is the characters: I want to read about the women. How did you find out you were going to write Ahsoka? Were you looking to write a Star Wars book or was it a happy surprise? Were you a fan of The Clone Wars (and specifically Ahsoka) before you started writing this book? I had asked my agent if he could look into getting me a Star Wars contract, so I had my hopes up! Eventually, I did get a very exciting phone call, and then we were off to the races. I loved the Clone Wars, and Ahsoka. For various reasons, I didn’t watch the show until after it was done, but it was certainly love at first sight. What kind of guidelines or guidance did you get from Lucasfilm about the outline of events in Ahsoka? They asked for a YA story about Ahsoka becoming Fulcrum, which put me on a pretty tight timeline (YA books are, generally speaking, YA because they’re about a teenage character, and Ahsoka was already 18 when I started). Aside from that, everyone was so generous with their time, making sure we stayed away from both A NEW DAWN and KENOBI in terms of the beats Ahsoka hit as another “Jedi, Alone”. How excited were you to see Ahsoka return near the end of Star Wars Rebels and see that her character survived long past the events of the end of that series? Did you have any idea that was the case? FUNNY STORY, so Rebels airs a week later in Canada, which meant I basically deleted my Twitter for a bit, and then ended up watching the finale in a subway station parking lot in Toronto almost two weeks after it aired in the US. I cried actual rainbows in the car, and probably shouted at the screen a bit, and then I pulled myself together—or so I thought, because halfway across the parking lot, I had to sit down on a bench and cry again. I was so excited. And no one spoiled me. And I am SUPREMELY grateful for that. You also wrote the short story “By Whatever Sun” that featured a character you created for the novel Ahsoka, Miara Larte, with Ashley Eckstein in FACPOV. How did you hear about this project and how did the team up with Ashley come about? Did you know right away you wanted to write something about Miara for this project? All of that actually began with Ashley. She told me she had an idea, and asked if I would write it. She wanted to put female pilots in the front row of the medal ceremony, and she wanted to use Miara. Obviously I said yes! Collaborating with Ashley was awesome, and working on the FACPOV anthology was soooooo much fun. This is more of a reader question. In “By Whatever Sun” Miara is at the medal ceremony in Yavin at the end of A New Hope. I got the feeling that she wasn’t a part of the Battle of Yavin but had gathered there with other rebels a short time afterward. Is that correct? Any chance Miara was in the Battle of Scariff or another famous rebel battle from a different film or TV show? Would you enjoy writing more Star Wars books in the future? If so, are there any specific characters or time periods you’d love to get a chance to write about? If you could write another story about one of the new characters you created for Ahsoka what character would you choose? More Miara or a different character? I would love to. I’d love to write Sabine Wren (before Rebels, not after. Okay, maybe after too.) or, for something completely different, Palpatine. Kaeden and Miara are the two characters I hold closest to my heart, of course, and I’d love to see them in the wider Rebellion. Can you talk about any books/comics you have coming out soon or are working on now? 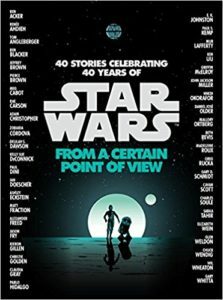 For fans that have only read your Star Wars stories is there a book of yours you feel like is the most obvious to recommend? I have a new YA out next year called THE AFTERWARD. It’s an epic fantasy set post-quest, when the knight and thief who fell in love while saving the world have to readjust to normal life and deal with things like student loans and the crushing weight of expectation. 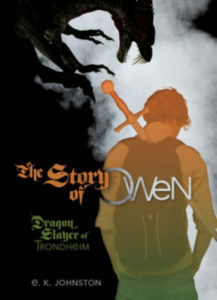 If readers found me via Star Wars, I would recommend THE STORY OF OWEN for a follow-up. It’s not a space adventure, but it is about a dragon slayer and his bard (or, perhaps more accurately, a bard and her dragon slayer), living in modern southwestern Ontario. You can find E.K. Johnston on Twitter @ek_johnston or at her personal website.